Ever wondered how milk is transformed into so many different things? From the sweetest ice cream to the richest cheese – and everything in between. This is how it’s done. At Kefalos we have proudly been making dairy products since the 1960’s, starting off with home made cheese. Fifty years later we produce almost everything you can make out of milk. All our milk comes from Zimbabwean cows, living and grassing freely close to our factory. That way we ensure fresh, quality milk from healthy cows, while minimising transport. Supporting local farmers is also an important part of our philosophy – and as our production grows, so do our suppliers. The cows are the key to our dairy products, and finding the right breed and taking care of the cows ranges high on agenda. Back in the 70’s, a high yielding breed called Red Dane was paired with an indigenous breed called Tuli and the result is an exceptionally adaptable breed that thrives in Savannah-like conditions. That way we can get a steady supply of milk, regardless of weather and season. Every cow has a personal name (not just a number!) and a personal journal as well. This way the farmers can keep track of yield and health on a daily basis to ensure a healthy stock. Early every morning a refrigerated tanker visits the farms. After the cows are milked and the milk is delivered to the factory, it’s tested by our resident laboratory to ensure a high quality.If the milk does not meet the set quality criteria, it is discarded. However, the dairy farmer will always get the analysis results and an action plan so the milk quality can be improved to meet our high standards. If the milk is accepted, it is pumped into refrigerated storage tanks within the milk receiving area at the factory. Further tests are carried out to see how the milk can be utilized and in which products, depending on parameters such as fat content, protein, total milk solids etc. This is done as different products require milk with a specific nutritional profile in order to achieve the best quality of product. In certain situations, milk is standardized to achieve the required profile before being used. The milk is then allocated to the respective departments for processing of their respective products; ice cream, yoghurt etc. 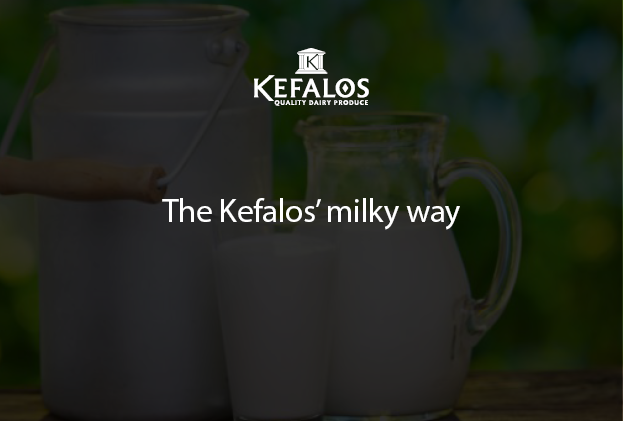 All milk at the Kefalos factory is pasteurised, a process whereby it is heated to approximately 75 °C for fifteen seconds, sometimes higher, depending on the product, killing harmful bacteria and ensuring product and consumer safety. The raw milk that goes on to become fresh milk is not only standardized and pasteurized, but also homogenised. Homogenization breaks down the fat globules to such a small size that they remain suspended evenly throughout the milk, instead of rising to the top, to avoid separation of the cream or fat phase from the water phase of the milk. Homogenisation, like pasteurisation, is a mechanical process that does not involve any additives. We produce a wide range of cheeses, from hard kefalotiri to creamy feta. The process of making cheese is a tasty way of preserving milk into a longer shelf life product that can be used at any time. Through heat treatment and separation of curd from whey, a combination of skilled craftsmanship and carefully selected cultures are used to achieve the desired characteristics in the cheese (flavour profile and texture) through a process known as fermentation. Once the cultures have worked to achieve the required level of lactic acid in the milk mix, we add non-animal rennet to achieve the formation of curd and separation of the curd from the whey (a vital liquid by-product rich in protein). We also use this protein-rich liquid in our ice creams, which contributes to the creamy mouthfeel associated with our ice cream lines. How the curd is treated afterwards is what determines the texture of the cheese. Hard pressing of curd using a combination of hands, tooled moulds and pressing machines, plus storage in temperature and humidity controlled maturation rooms over long periods of time to form cheddar in hard blocks or a gentler pressing and draining of curd forms the softer haloumi, which can be packed and used as soon as one day after it has been produced. Our ice creams are rich and creamy, sweetened with cane sugar frozen delights (recognized and used by many Zimbabweans as a snack or dessert). One of our secrets to the delicious quality of our ice cream lies in the time that we age or slowly agitate the ice cream base in the ageing tanks before we mix in flavours or pastes and pack as frozen product. Most of our ice cream lines use natural colours and in the case of our premium range, some of the highest quality flavours comes from suppliers who never negotiate on the quality of the products they supply. Our yoghurt uses the highest quality milk that we receive at the farm. Apart from using milk that is carefully selected for its protein content, we further add nutritional value to the yoghurt by use of probiotic cultures, which are beneficial for gut health. Our yoghurt making process involves fermentation by starter cultures as well as acidophilus and bifidus cultures (AB cultures) at controlled temperatures that ensure the best performance of the cultures. We have selected specific cultures that impart very specific attributes to our final product, such as thickness, texture and flavour, as well as scoopability. We prefer a thick and creamy product that scoops well on a spoon, leaving what we call a ‘short tail’ on the base of the spoon. (You can test this yourself at home by dipping a spoon into a tub of yoghurt and seeing if it cuts ‘short’. If it does, you’ll know that you have yourself an authentic Kefalos yoghurt). We have worked tirelessly to select fruit pulps and flavours that have a true flavour profile with natural colours. (By the way, did you know that our berries of the forest yoghurt actually contains chlorophyll, which is a natural colour extracted from plants? This is the same colour used in our After 8 ice cream – but the difference is simply AMAZING!). We collect the cream from milk through a high speed rotor machine called a separator, which works by separating the light fat component from the heavier phase of the milk. Both products exit the separator through different openings: The cream is collected into a cold tank and is gently agitated under sterile conditions, whilst the milk is diverted to the product lines that requires the use of skimmed milk e.g. Mozzarella cheese production, low fat yoghurt and fresh skimmed milk. Our handmade butter is produced by stirring cream in a butter churn, which allows the milk fats to form soft butter balls, separating them from the rest of the cream. Over time, the balls form a bigger mound or block of butter which is eventually separated from what is known as the buttermilk. We drain the buttermilk off and cold wash the butter block with cold water, pack it wax paper, plastic or tubs and refrigerate them until required for cutting or for sale. All our dairy products are packaged in a sterile environment in containers that are designed to keep our products fresh, clean and wholesome. We ensure that all personnel who handle food products within the factory go through rigorous hygiene training at recruitment stage, which they must abide by during their work. Our distribution company, The Cheeseman, collects Kefalos’ products in refrigerated trucks and distribute them to stores, restaurants, retailers and schools all over Zimbabwe. Kefalos is happy to be part of a food chain that ensures nine essential nutrients to children and adults, promoting good health and well-being throughout all stages of life.